Pictured Rocks was the first National Lakeshore to be included in the National Park Service system. The sprawling site in Michigan’s upper peninsula offers visitors the chance “to explore miles of pristine beaches, hike over 100 miles of trails, and experience the serenity of the northern hardwood forest.” I visited the eastern part, near Grand Marais, in May. Shoreline just west of Grand Marais, MI. It’s a stunningly beautiful natural area. But lots of people passed through before Pictured Rocks was established as a park. Two lighthouses have been preserved, but sharp-eyed visitors can find hints of other aspects of the area’s human history. Some of the stories they suggest are about greed and environmental devastation. Some are about love and loss. In the 1800s, lumberjacks logged the northwoods’ red and white pine, and white cedar. In the 1930s and ’40s virgin hardwoods were logged too. The loggers lived in camps hastily constructed of the trees they spent their days chopping and sawing down. 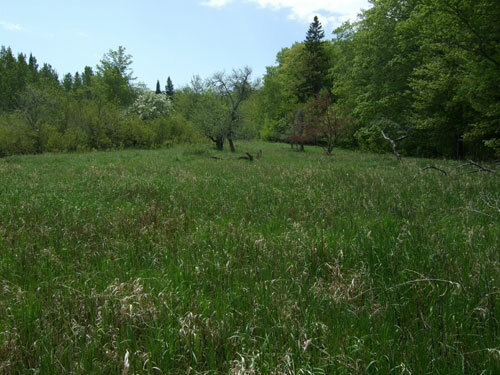 Today, second-growth forest has reclaimed the terrain. 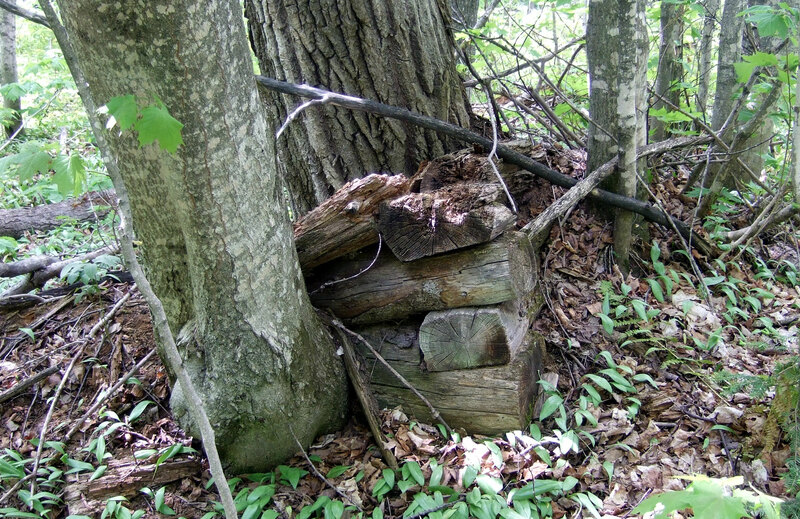 This corner (below) is all that’s left of a lumber camp. 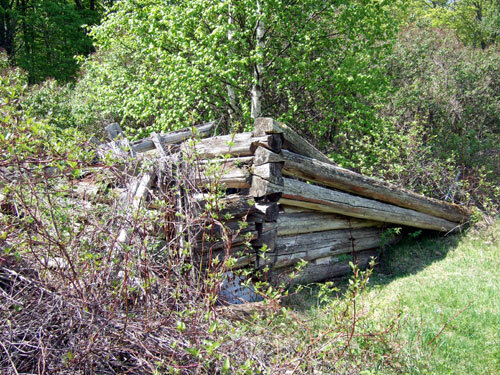 Last remains of a lumber camp. Perhaps it was once a bunkhouse...? The men slid the logs down spectacular sand dunes to the lakeshore for transit. 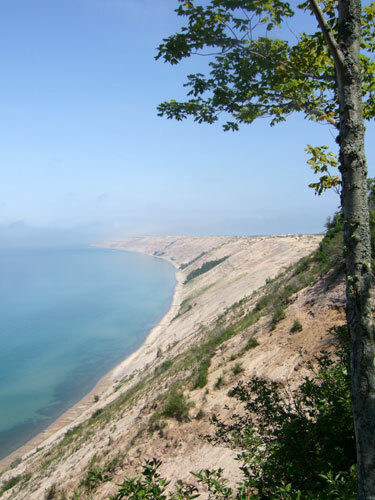 Lake Michigan was the highway of its day, with ships hauling natural resources east to market. Merchants in Detroit and New York accepted shipment of furs and timber, and sent ships west with supplies and goods. 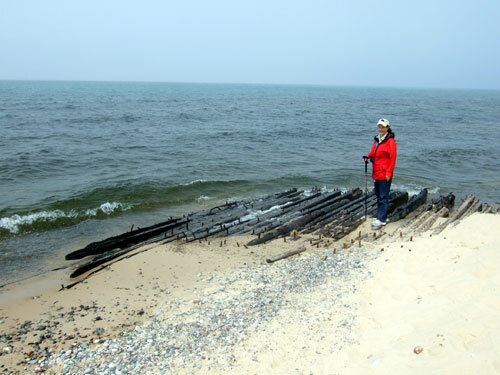 Today, a hike along one of the beaches within Pictured Rocks reveals evidence of a voyage gone wrong. Remains of a shipwreck, along the beach near Au Sable Lighthouse. Once the logging era ended, parcels of land were sold to farmers, or to people looking for a place to build a hunting or vacation getaway. Little is known about the people who once lived in “the Jones Cabin,” below. This cabin is quietly disappearing into the landscape. The decision to turn this area into a national lakeshore, which forced some residents to leave homes they loved, was controversial. That’s been true in the case of almost every national park created, of course. Those of us who benefit owe a debt of gratitude to everyone affected by the designation. This clearing, and the apple tree in bloom in the background, are all that's left of the people who once lived or farmed here. Although these tangible remnants of human activity within the Pictured Rocks National Lakeshore aren’t actively interpreted, the stories they tell are an important part of the cultural landscape. 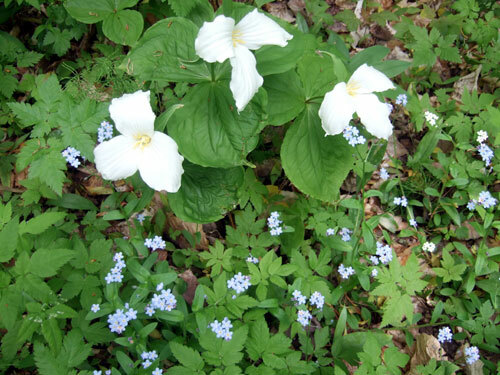 Trillium are one of the protected native species of wildflower that park visitors like me can enjoy each spring. The smaller flowers in the lower portion of the photo below were recently named an invasive species. Perhaps the plants were first introduced by some farmwife, and later escaped from her garden. The small flowers are Forget-Me-Nots.